The phrase “brussel sprouts” used to send evil chills up my spine when I was a kid. Since then I’ve discovered numerous creative ways how to cook brussel sprouts that would please even the toughest of critics. I guess some foods your taste buds just need a chance to grow into. One of my favorite dishes is called “Mediterranean Brussels Sprouts” and it’s one of the easiest and most delicious ways I know of how to cook brussel sprouts. To make the Mediterranean Dressing, in a small bowl combine extra virgin olive oil, dijon mustard and parsley. Mix well and set aside. Fill a medium sized pot with about 2 inches of water, place vegetable steamer in pot and heat on medium-high. While water is heating, quarter the trimmed Brussels sprouts and let sit for 5 minutes. Once the water has reached a boil, steam Brussels sprouts for 5 minutes. Add the garlic for the last 2 minutes. 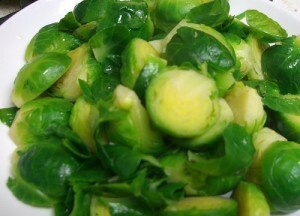 Remove Brussels sprouts and garlic from pot and toss with Mediterranean dressing while still hot. Season with sea salt and fresh black pepper to taste. Serve immediately. Brussels sprouts are best served with fresh grilled Salmon. Many health benefits come from eating a diet which includes Brussels sprouts, such as cholesterol-lowering cancer prevention. Note: the correct phrase is actually “Brussels sprouts” as opposed to “brussel sprouts” but since most people know them as the latter, I figured I’d fall in line. Who am I to fight with tradition?